Dies R Us: All You Need is LOVE! Happy Die R Us Thursday everyone! 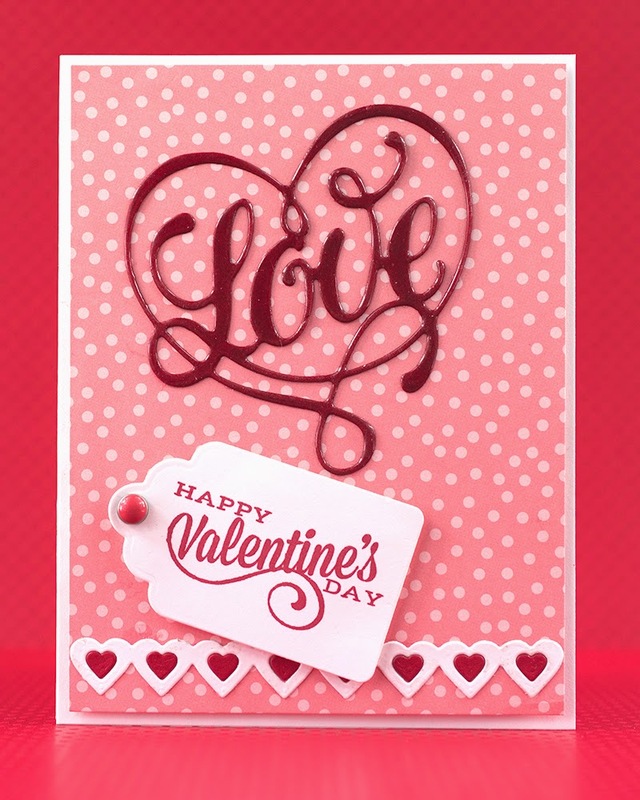 Robin here with another Valentine's design using a few of the many dies from Dies R Us! 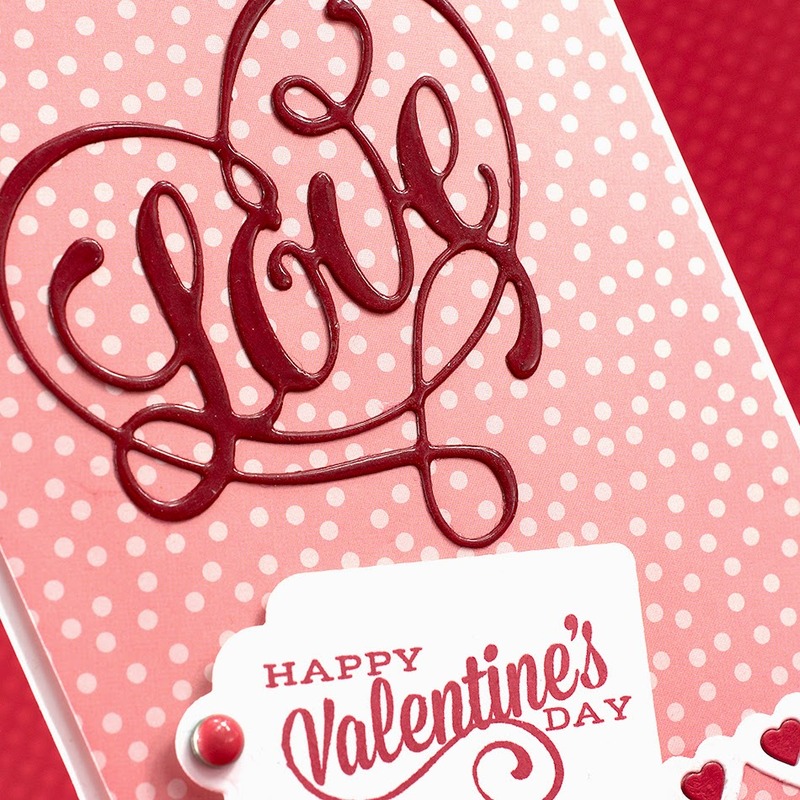 I think Valentine's Day is such a sweet (no pun intended) day to remember your sweetie! Not to mention the next day just happens to be my birthday...are you listening DH? My card starts with a white side fold card base, A2 in size. I then cut a sheet of polka dot card stock slightly smaller and set aside. The fancy heart is Die-Versions Fancy Love Heart and was cut from red card stock. Then I covered the heart with VersaMark and used clear embossing powder to give it a shinny appearance. The bottom heart strip is Hearts Border from Tailored Expressions that I cut from white card stock and adhered to bottom of dotted paper. I cut the same die again, this time using red card stock and inlaid the hearts into the strip. I glued the fancy heart onto the background paper and then adhered the entire background to my card base using foam tape. I stamped my sentiment and cut it out using Taylored Expressions Tag Stacklets 1. I added an enameled brad and adhered the tag to my card using foam pop ups. Be sure to check out Dies R Us, not only is it a GREAT store but they have an Inspiration Blog AND a twice monthly Challenge Blog! Don't be left out! I love the card! I also love the stamp sentiment and font. Where is it from? I like alot of the stamps/sentiments you guy spost onthe blog but there is not usually info on the stamps/ Could you guys add that info as well? Thanks. Susan you might have better luck getting MORE detail if you click on the photo of the designer who created the card to take you to their personal blog post. If it's not there you might comment there asking for the information.